Mainboard is the central or primary circuit board in computer as interface between devices within computer by making up a complex electronic system. Mainboard has PCB (Printed Circuit Board) are used to connect devices using conductive pathways, or traces. Bus System is the main element of mainboard that is connector of electric line to devices on mainboard. If you notice copper line on PCB of mainboard, it will be the pathway of signal. It is like the road for transportation especially the most important data. These pathways of signals can be called "Bus System" A good bus system must have enough speed to allow other devices receive and send data effectively. Surely, form factor that is AT and ATX have been generally sold in IT: Information Technology market. Users mostly choose to buy ATX because it has more effective design for solve problems especially the connection of devices while it is working, such as CPU has its position near Power Supply in order to remove warm air from inside the case. Moreover, it uses Power Connector that is designed as the single Packet and is an electrical connector designed to carry a significant amount of electrical power and much more. The structure of Bus system in microcomputer is continuously developed from past to present. Expansion Slots has been created by adding devices into. 1. XT Bus (Extended Technology) The XT bus architecture is an eight-bit, used by Intel 8086 and Intel 8088 systems. 2. AT Bus (Advanced Technology) is almost always shortened to ISA Bus. The AT bus architecture is an 16-bit bus, 8 MHz used by Intel 80286. 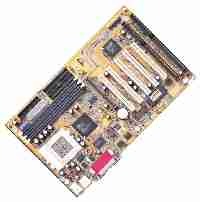 Nowadays, we have seen it in new mainboard. 3. VL Bus (VESA Local Bus) ). It is 32-bit bus width, used by Intel 80386 and Intel 80486 systems. 4. PCI Bus (Peripheral Component Interconnect) It is 32-bit bus width, 33.33 MHz clock with synchronous transfers. The standard speed of PCI Bus is half of External Bus of CPU, for example, bus for CPU 66 MHz PCI Bus is 66/2 = 33 MHz and bus of CPU is 100 and 133 MHz, PCI speed is 100/3 and 133/4. AGP (Accelerated Graphic Port )(Accelerated Graphic Port) as well. It is the slot designed for attaching a graphics card with maximum data rate. 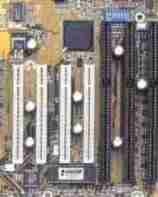 In a mainboard, there will be one slot. AGP is 32-bit channel operating at 66 MHz resulting in a maximum data rate of 133 and 266 MHz. SIMM has 30 pins, provides 8 bits of data and has 72 pins and provides 32 bits of data. DIMM, including, SDRAM has 168 pins, provides 64 bits of data. They are the parts that are connected with power connector, have 2 types include AT 12 Pin (P8, P9) and ATX 20 Pin. When AT is connected Power Connector to motherboard connectors, the black wires on either connector must be plugged correctly. You can plug in one way. If they were misconnected, they can lead many people to damage their boards. For ATX is controlled by head of connector, it is hard to be misconnected. BIOS refer to be stored in ROM. The primary function of BIOS is to prepare the machine so other software programs stored on various media can load, then the computer performs the Power-on self-test that is a set of diagnostic tests in the computer. If BIOS is damaged, the computer won't be finally used. You must repair by programming new BIOS. Real Time Clock determines the frequency in working of devices. The clock rate of a CPU is normally determined by the frequency of a crystal. Controller is a part that controls working of Drives include Hard Disk Drive, CD-ROM Drive and Floppy Disk Drive. In the part, controller is freely outside, called "Controller Card or Multi I/O" that can control and interface with input and output devices together, but controller is completely installed in mainboard now. 1. The nickel-cadmium battery has a nominal cell potential of 3.6 V.
2. The Lithium battery has a nominal cell potential of 3 V.
Serial Port Port is serial port, can be also called COM 1, COM 2, mouse port, etc. which information transfers in or out one bit at a time, used with devices that aren't high speed, such as Mouse and Modem, etc. Parallel Port can be called LTP Port, so this type of port is high speed port, used with Printer, Scanner, etc. USB (Universal Serial Bus) is a serial bus standard to interface devices. It is popular with the highest speed, and security. USB supports Plug & Play system that allows easy installation; there are many devices, used with USB Port such as Mouse, Keyboard, Printer, Scanner, Modem, Camera Digital, etc. Mostly, the devices that interface with computer will be USB. In the part of switch has Power Switch. For mainboard AT, there will be using A.C. 220 V, but mainboard ATX will open power supply through mainboard. The other switch is Reset Switch; its duty is switching your computer off and on again each time you wish to reset. 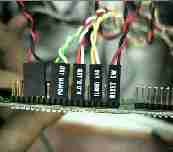 Jumpers are typically used to set up or adjust printed circuit boards, such as the motherboards of computers and is used to close a break in or bypass part of an electrical circuit.. Jumpers are almost always copper.